Yellow-twig dogwood (Cornus servicea 'Flamiramea'), a deciduous flowering shrub, is a named cultivar of the red-twig dogwood (Cornus servicea). While the species variety and other cultivars have red stems, 'Flamiramea' has yellow or greenish stems. This is an upright, suckering species with multiple stems that can grow up to 9 feet in height, although the 'Flamiramea' cultivar typically stays under 6 feet. The shrub's golden stems offer good winter interest, and in late spring, flat-topped clusters of white flowers appear, followed by white berries in summer, which are much beloved by birds. Fall foliage is golden yellow, though not particularly showy. Native Area: North America, except for lower Midwest and deep South. Plant yellow-twig dogwood in moist soil that is organically rich, in a full-sun to part-shade location. This is a plant that does quite well in boggy conditions. To control the spread of the plant, trim the roots away regularly before they can sucker and spread. 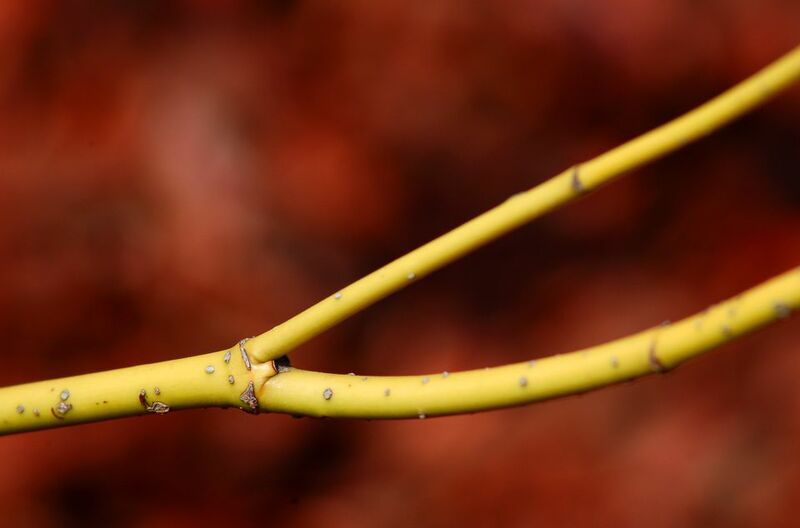 Because the best stem color occurs on young stems, trimming away about 25 percent of the old stems early each spring will stimulate new stems and good color. Or, you can cut the entire stem down to about 8 inches above the ground every 3 years or so to rejuvenate it. Yellow-twig dogwood, like other types of dogwood, grows well in full sun to part shade. In warm climates, they may prefer shade. The best soil is consistently moist and rich in organic material. Digging in compost will help poor soils. Water regularly to keep the soil moist. The plants need lots of moisture when young, but will tolerate short periods of drought once established. Dogwood likes fairly cool summer conditions, and may develop diseases such as canker in warm climates near the southern extent of its hardiness range. Fertilize in spring with a granular fertilizer worked into the soil. Like other dogwoods, yellow-twig dogwood can be propagated by seeds, but it is generally easier to do it by green stem cuttings. This process is not difficult, but it does take some time. Fall is generally the best time to take cuttings from dogwood. Create a rooting mixture by combining equal parts peat moss and sand. Place the rooting medium in a small pot and water frequently until the peat moss is consistently moist. Take a cutting from a green living stem on the shrub, about 9 to 12 inches long. Trim off the cutting with a slanted cut just below a leaf node. Make sure there are at least two leaf nodes below the bottom leaves on the cutting. Dip the bottom of the cutting (the slanted cut and at least two leaf nodes) in rooting hormone. Bury the cutting into the rooting hormone so the slanted cut and at least two leaf nodes are covered. Cover the container with clear plastic and keep it outdoors, out of direct sunlight. It can take as much as a full year for the cutting to root. Once it has rooted, transplant it into your landscape. Thin out about 25 percent of the stems each year to keep stem color its best. C. sericea is often victimized by the dogwood sawfly, which can strip the plant of leaves. Sawflies can be treated with pesticides, or you can remove the larvae by hand. Plants can become stressed and vulnerable to canker and other diseases in hot and humid summer climates south of USDA Zone 7. The widely-spreading root systems of yellow-twig dogwoods make them good choices to plant on a bank, where erosion control is needed. But that same strong root system makes them poor choices as plants above septic tanks and drain fields. These shrubs serve as specimen plants in winter, when (outside of evergreen trees and shrubs) there is little plant color in the yard. Plant them where you can enjoy them. For example, try growing them within view from a kitchen window, from where you can see them pushing up through the snow. Use yellow-twig dogwoods in combination with red-twig dogwoods for an even more stunning winter display. With or without red-twig dogwoods, yellow-twig dogwoods look best when planted in a mass. They also look good when growing up against the wall of a building (a brick wall seems to suit them very well), especially if the winter sun strikes this wall in the late afternoon.